March 25th was celebrated for the first time in 1838, as a memorial day for the Greek Fighters of 1821, and since then the celebration was introduced throughout pan-hellenism. The establishment of the feast of March 25th is due to two people. One was the Fighter in 1821 who became Mayor of Athens, Dimitrios Kallifronas. The second was George Glarakis, Secretary of State for the Church, Public Education and the Interior, who had proposed to King Otto to adopt a decree which would set March 25th as a national celebration. The celebration began on the evening prior with 21 cannon shots. The next day, Friday morning, the day of the Annunciation, Athens awoke to 21 more cannon shots, a symbolic number. 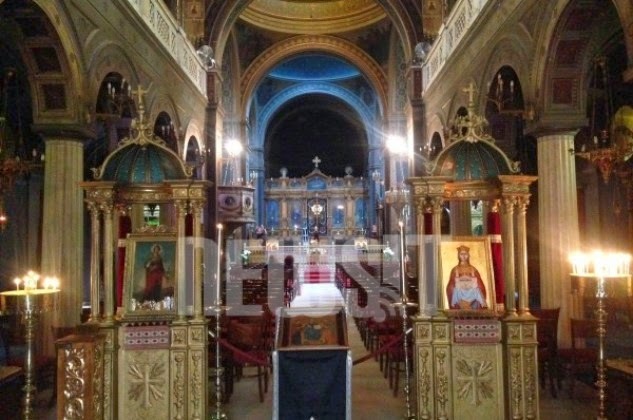 The morning of March 25, 1838 a doxology was chanted in the then Metropolitan Cathedral of Saint Irene, located between the streets Aiolou and Athinas. The doxology was attended by Otto who was dressed in a traditional foustanela. In the evening there was organized by the Municipality dancing in the square of the old Palace in which all the youth of the city participated regardless of their social class, and many Fighters from 1821 attended. At night the Mayor illuminated with oil lanterns the main streets and the Acropolis. It is said that the Athenians were left astonished when they saw lanterns on Lykavettos held by the youth of that time forming a huge bright cross with the words: "In this conquer" ("Εν τούτω Νίκα"). The first Metropolitan Cathedral of Athens, the Church of Saint Irene, is said to have been built from the ruins of seventy Byzantine churches that were destroyed during the Bavarian occupation. With the transfer of the seat of the Greek government from Nafplio to Athens, Saint Irene became the official cathedral of the capital. The renovation and repair of the church was undertaken in 1845 by the famous architect Lysandros Kaftatzoglou. The project was completed in 1850. The coming of age ceremony of King Otto took place here in 1835, and in 1845 Theodoros Kolokotronis, the hero of 1821, was buried here, which is why next to it is Koloktronis Street. There are also historical accounts of that day. Ministers, the people of the spirit from Hermias Street (today's Ermou), came down and reached the outside of Saint Irene. They followed the coffin of Kolokotronis and his horse dressed in black. In the same church there took place in 1877 the burial of Constantine Kanaris, the admiral and fighter of the revolution of 1821. In the Sacred Church of Saint Irene Queen Amalia made her confession. There was also a doxology in this church for the Greek Constitution, led by the Teacher of the Nation Neophytos Vamvas. Construction of the new Metropolitan Cathedral of the Annunciation began on Christmas Day, 1842 with the laying of the cornerstone by King Otto and Queen Amalia. Workers used marble from 72 demolished churches to build the Cathedral's immense walls. Three architects and 20 years later, it was complete. On May 21, 1862, the completed Cathedral was dedicated to the Annunciation of the Mother of God (Ευαγγελισμός της Θεοτόκου) by the King and Queen, to celebrate on the national feast day of March 25th. Inside are the tombs of two saints killed by the Ottoman Turks during the Ottoman period: Saint Philothei and Patriarch Gregory V.